A UK government minister has resigned after it was revealed she held secret meetings with Israeli officials. Priti Patel met Israeli Prime Minister Benjamin Netanyahu and other senior figures while on a private holiday with her family in August. She apologised on Monday, but was ordered to return from an official trip to Africa on Wednesday after further revelations came to light. Ms Patel said her "actions fell below the high standards that are expected". Her resignation is the culmination of an unusual chain of events that may seem complicated. So let's take a step back. Priti Patel, 45, is a politician with the ruling Conservative Party, who has long been viewed as a rising star of the party. She has had numerous roles in government, and in June 2016 was appointed Secretary of State for International Development. This means Ms Patel is responsible for overseas development and the UK's programme of assistance to developing countries. It is fair to say Ms Patel is positioned on the right of the Conservative party. She is a longstanding critic of the European Union, has voted against gay marriage, campaigned against the smoking ban, and is a long-standing supporter of Israel. 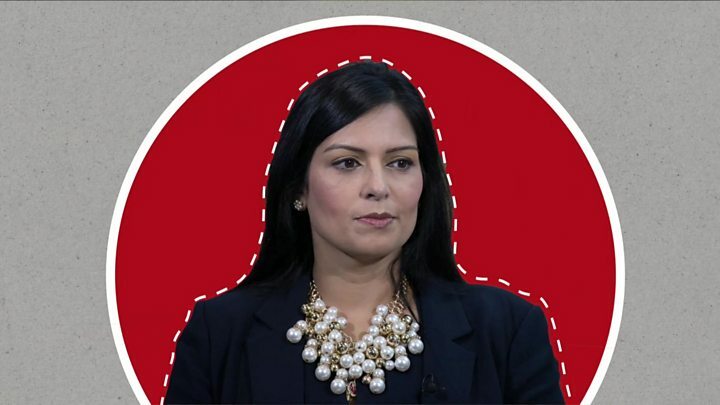 You can read our full profile of Priti Patel here. Last week, the BBC revealed that Ms Patel held a number of undisclosed meetings with business and political figures during a family holiday to Israel in August. She met the leader of one of Israel's main political parties and made visits to several organisations where official government business was reportedly discussed. This is unusual, because ministers are supposed to tell the government when they are conducting official business overseas. After the visit, Ms Patel suggested some of Britain's aid budget go to the Israeli army. She also asked her officials to see if Britain could support humanitarian operations conducted by the Israeli army in the occupied Golan Heights area. That request was labelled as "inappropriate" by government officials. The UK, like other members of the international community, has never recognised Israeli control of the Golan Heights, an area seized from Syria in the 1967 Six-Day War. Prior to resigning, Ms Patel apologised for not informing the Foreign Office of the meetings and for suggesting Boris Johnson, the foreign secretary, knew about her plans in advance of the visit. "In hindsight, I can see...how meetings were set up and reported in a way which did not accord with the usual procedures. I am sorry for this and I apologise for it," she said. The government initially welcomed Ms Patel's "clarification" and said Prime Minister Theresa May had "reminded her" of her obligations. One Foreign Office minister defended the meetings, and said government policy did not change as a result of the trip. The opposition Labour Party said Ms Patel must be investigated or "do the decent thing and resign". Labour's shadow secretary of state for international development branded it a "black and white case" of the ministerial code being broken. Ms Patel was also derided on social media, with some questioning how a family holiday can possibly include meeting a world leader. There were fairly regular developments throughout Wednesday, many of which made life difficult for Ms Patel, the government or both. It emerged that Ms Patel had two further meetings in September without government officials. She met the Israeli public security minister Gilad Erdan in Westminster and Israeli foreign ministry official Yuval Rotem in New York. To complicate matters, a story published by the Jewish Chronicle said the government was aware of the New York meeting and told Ms Patel not to disclose it. The government denied this. BBC political editor Laura Kuenssberg said that "revelations about more extra-curricular meetings" meant that if Theresa May didn't sack her the scandal would become "an ongoing sore that smacks of weakness". Following the revelations, Ms Patel cut short an official trip to Uganda to fly back to the UK. At one point on Wednesday, thousands of eager people ended up tracking her flight home. With no wi-fi on board her plane, everyone awaiting her arrival knew she was not aware of all the developments swirling around Westminster. So when it was revealed Ms Patel had resigned as international development secretary it put an end to a day of speculation. Ms Patel's resignation comes amid a tumultuous period for Theresa May's cabinet. There were calls for Foreign Secretary Boris Johnson to resign after he wrongly said a British-Iranian woman held in Iran was "teaching journalism", leading to fears she could have her prison sentence doubled. That followed the resignation of Sir Michael Fallon as defence secretary after allegations were made about his behaviour. Now, having resigned from her position, Priti Patel may regret that she was not more forthright all along.